Last Friday in Taipei, I went for a second ride with Dahon to test ride some prototypes and hang out. On the way, Josh Hon and I riffed about how we ride in the U.S. all decked out in Spandex, cleats, and helmets, whereas in lots of other places in the world, bikes are just normal part of life, no fuss required. 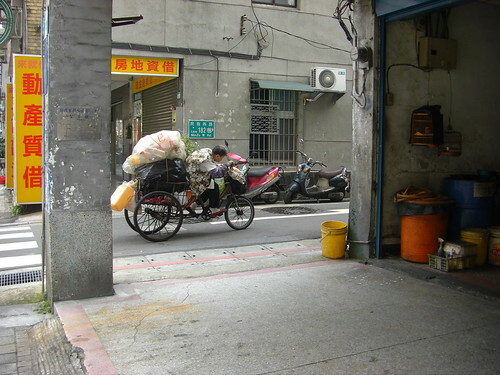 Apropos that conversation, in Taipei I saw people moving themselves on bikes, but I also saw a ton of people using bikes for work–such as this ancient woman grunting a load of who-knows-what to who-knows-where. These three wheelers were everywhere–some heavily modified with gas-powered motors and low gearing. But only this one was moving slowly enough for me to get a photo–whatever she was hauling must have weighed a ton. Photo: Grunt, originally uploaded by mobil’homme.